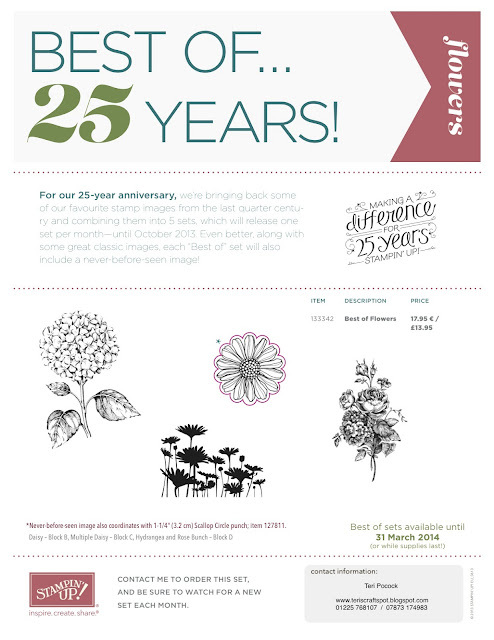 We have another special offer from Stampin' Up! today. To celebrate their 25th Year Anniversary, they are bringing back some of their most popular images. These will be available in a special set which will be released at the start of each month from June until October. The cost of each set is £13.95 and will be available in CLEAR MOUNT only. Each set will contain several classic images together with a never seen before additional image! The set will come to you packaged in a DVD case - exactly the same as our other clear mount stamp sets. Once released, these sets will be available to buy at any time until 31st March 2014. You can download the flyer by clicking on the picture in my right hand sidebar. This set is available to purchase from today. If you would like to order one, please contact me.